"...this course is making a difference to me and my family's life. I've noticed some of my thinking has changed and I'm really excited about that." "I wasn't doing anything (physical activity) before the program, but that's all changed after Healthy Lifestyle." "I have really - really - felt this self acceptance and that has been the first time I can remember feeling that. It's been huge." 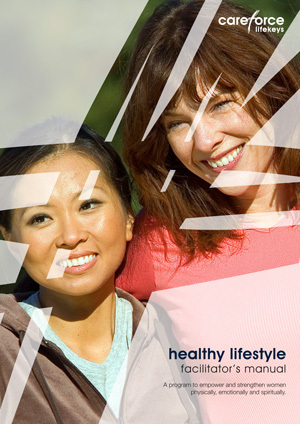 Healthy Lifestyle is a ten-session program for women of any age who are seeking to unlock their physical and spiritual potential. The program empowers and motivates women to be proactive, have fun, learn about their health and explore the possibilities of a more active lifestyle. Participants are helped in establishing a healthier lifestyle through a physical activity component in addition to the normal teaching and small group time. The co-ordinator of Healthy Lifestyle should possess a background tertiary or higher education qualification from a mainstream institution in a health related discipline. This may include nursing, health education, psychology, physiotherapy, nutrition or personal training. In addition to normal Lifekeys training requirements facilitators must have a current lifestyle that is consistent with the material in the program and therefore be effective models to participants. Care should be taken to protect participants from the possibility of facilitators using the program to further their own healthy philosophy agendas. This session introduces the holistic health concept and the interconnection between mind, body and spirit. It explains the stages of behavioural change and the progression through them, and it inspires and encourages for the journey ahead. This session introduces the definitions, types and intensities of physical activity, it explains the benefits of being physically active and why, it explains the physcial activity recommendations for good health in adults and motivates participants to achieve these and finally it introduces the Borg Scale. The aim of this session is to explain the benefits of good nutrition, and the importance of disease prevention, to explain the daily recommended dietary intake requirements for women of different ages and the reasons why, to explain macro and micro nutrients, and to instruct on how to read nutrition labels. The aim of this session is to explain and define the types of strength training including fitball principles, to explain the benefits of strength training including bone mineral density changes over the life span, and finally to teach safe and conffident application of strength training variables. This session defines and explores emotional eating, what causes it and what satisfies it. It explains how to determine if you are an emotional eater and identifies the possible triggers. It teaches techniques to utilise while attempting to break the emotional eating cycle and lastly it provides practical tools and hope for change. This sessions explains the physiology of weight gain, it disperses myths on weight loss procedures and fad diets, it describes the mechanism behind weight loss, it shows how to set health rather than weight loss goals, and it explains the benefits of weight loss and the dangers of weight gain. This session explores the basis of perceptions of beauty and self, it explains the relevance of body image and self-esteem to our health, providing practical help in improving body image and self-esteem and it explains the importance and 'how to' of self-care. This session aims to provide an understanding of the importance of motivation, it explains the different forms of motivation that may be used, and it provides practical tools to get back on track when goals are missed. This session aims to introduce the health wheel as a useful assessment tool for measurement of holistic health, to inform women in the area of preventative health care, to highlight the signficance of mental health and the impact of stress and depression and lastly, to discuss spiritual health, increase awareness of it and how to keep a healthy spirit. The teaching in this session consists of reviewing previous sessions in acknowledgement of how far participants have come, and it concentrates on providing foundational advice for the journey ahead and maintenance of a healthy lifestyle. # This program was formally evaluated as part of Michelle Jorna’s (co-author) Masters Thesis. The results were presented at the National Physical Activity conference in 2005, and were so significant she was asked to submit a paper which was published in the Journal of Science and Medicine in Sport in 2006. Ref: M. Jorna, K. Ball, and J. Salmon, “Effects of a holistic health program on women's physical activity and mental and spiritual health,” Journal of Science and Medicine in Sport, 2006, 9 (5): 395-401.